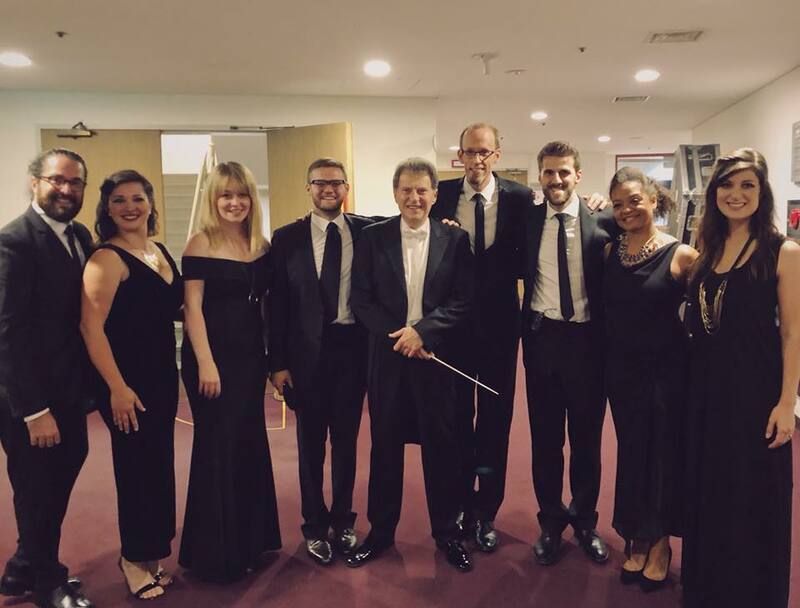 I've just come back from South Korea, where The Swingles have been performing Berio’s Sinfonia with the KBS Symphony Orchestra, conducted by Yoel Levi. Saturday's concert was my 20th performance of this extraordinary piece, whose premiere was 50 years ago this year. In honour of its anniversary and my mini-milestone, here are 20 reasons I love performing it. To experience it first-hand, come and see us do it at La Scala, Milan (24 September), and Royal Festival Hall, London (8 December). 1. Its opening sounds like the dawn of time. The piece starts on this mysterious chord (right). I guess you can think of it as a couple of diminished chords stacked over a bass D – In The Swingles we just call it “Chord 1”. It opens out from a hum (marked pppp) to a series of vowels. For the first three bars of the piece we sing in homophony, on the same vowels and rhythms, before the voices start to pull apart and we hear the first intelligible words: “il y avait une fois…” (Once upon a time…). The movement uses text from Claude Lévi-Strauss’s book on mythology, Le cru et le cuit, and I like to imagine the opening as Berio’s own musical creation myth, with consciousness and language emerging from the primordial swamp. 5. It shares my taste in books. Joyce, Eliot and Beckett were three of the writers who got me fired up about modern literature at school and university. As well as using fragments of Beckett’s The Unnameable, Sinfonia’s famous third movement has a kinship with The Waste Land or Finnegan’s Wake in its patchwork of quotations and allusions. You can feel Berio delighting in the text he uses, not just the sense but the sound of the English, French and German words. 6. It’s a white-water boat ride. As the River Thames runs through Eliot’s text and the Liffey through Joyce’s, Berio uses Mahler’s 2nd symphony in movement 3 like “a river flowing through a constantly changing landscape”. It’s by turns a pleasure cruise and a white-water adventure, surreal and unpredictable. 7. It has jokes in it. The best advice I can give to a new listener intimidated by Sinfonia’s “difficulty” is: you’re allowed to find it silly. Some bits of it are silly. (I agree with David Bruce, who in this video compares it to a Looney Tunes cartoon.) It's full of humour, whether it’s the sheer ridiculousness of some of the vocal gibberish, or the witty musical in-jokes. 8. It’s a lesson in orchestration. Berio, one of the first to use amplified voices as a symphonic texture, gets incredible results from his orchestration choices. Two of my favourites: (a) that first chord, with the breathy, dissonant vocals blending with the ceremonial sound of the tamtam, and (b) the goosebump-inducing crescendo near the end of movement 2, a high G that starts with one soprano, grows to include all 4 female voices, then imperceptibly hands off to the trumpet section. 9. It allows me to sit within the world’s best orchestras. When I decided to give up the clarinet after Grade 4 and switched to voice and guitar, my chances of playing with world-class orchestras should have evaporated. But thanks to this piece I get to experience the workings of incredible symphonic forces, led by brilliant conductors, from the inside. It doesn’t get old. 10. It’s really difficult. I’m not saying you should care about this as an audience member, but it would be remiss not to mention that the piece is really, really hard. The sheer concentration required and the adrenaline rush when it goes well are hard to beat. 11. I mean, look at this page. 14. I don’t have to play the piano part. As difficult as the vocal parts are, nothing makes the blood run cold quite like the piano solo near the end of movement 1. Many a fine pianist has come unstuck with it, only to be quietly replaced after the first rehearsal. 15. It’s full of buried treasure. The piece is so intricate that I know I will hear something new each time we do it. 16. It’s a gateway into the classical canon. I came to the piece as someone who wasn’t all that familiar with the Western symphonic repertoire, so movement 3’s quotations were mostly lost on me. Rather than recognising a fragment of Bartok, Berg or Berlioz in the piece, I’m now more likely to hear something on Radio 3 and think: “oh, that’s in the Berio”. It’s probably the opposite of what was intended, but the piece has become part of my framework for understanding the whole of classical music, and my response to (say) Debussy’s La Mer can’t now be disentangled from my love of Sinfonia. 17. It connects me to a legacy of performance. To be honest, this is partly vanity, the smug feeling of being part of a select club of people (mostly Swingles past and present) who have conquered the summit of this piece. But more importantly, Sinfonia itself is about the musical tradition and the act of performance. It's highly self-conscious, with the narrator in movement 3 mentioning the singers and conductor by name. 18. It jolts you into the present moment. One of the piece’s most effective tricks is setting up hypnotic textures and then jolting you out of them. Especially after having sung it multiple times, I always appreciate these in-built reminders that we’re engaged in a new and volatile creative act. 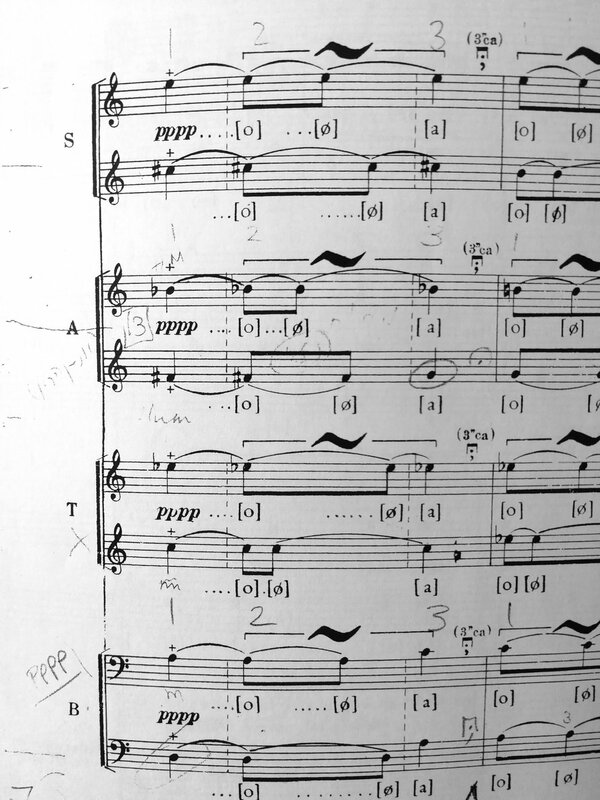 Pay attention, Berio seems to say – it’ll never sound quite like this again. 19. It still has the power to shock. Sinfonia brought the political unrest and energy of the 1960s into the concert hall, and fifty years on, it’s still a strong flavour. Some people love it, some take against it, and some walk out before the end. We’re a group that sometimes gets filed under Easy Listening – and believe me, we want our music to be enjoyed by the widest possible audience – but it’s thrilling to be part of something so visceral and provocative too. 20. It does stillness and beauty too. The piece is not all chaos and cacophony. Movement 2 in particular is a haunting, crystalline memorial to Martin Luther King, with occasional gunshot-like accents piercing the hushed, magical texture. Maestro Levi, who pulls off the extraordinary feat of conducting the whole piece from memory, says this is where he struggles not to fall under the spell of the music. Here's a recording from one of the earliest performances, conducted by Boulez. Enjoy. Thinking back to that tour, I realise that Dorothea’s has been our spiritual home this year. As winter gave way to spring, we were writing Christmas music. As spring turned to summer, we were rehearsing Christmas music. On the hottest days of the year, we were recording Christmas music. On long July evenings were were listening to mixes of Christmas music. In the autumn we were designing cover art for Christmas music and putting the final touches to live arrangements of our new Christmas music. Incredibly, we’re not yet sick of Christmas music. It’s five years since I first tried to write a Christmas song. My first attempt began brilliantly: I wrote this beautiful, soaring, classic melody and congratulated myself on my rare genius, until I realised I’d directly lifted the tune of “Chestnuts roasting on an open fire” and came back to earth with a pfffft. Even failed songs usually have a few parts you can salvage from the scrap, though, and there was this one lyric I liked, which I found myself revisiting later, in that listless week between Christmas and New Year, presumably while wearing a lovely new jumper. “Storms laid the snow thick on the ground” was the line which I expanded it into two melancholy verses about love and the changing of the seasons, calling it The Thaw. I played the tune a few times with my jazz quartet, and half-forgot about it. It’s nine years since I first heard the name Kurt Elling. I was in New York City with my university group The Oxford Gargoyles, for the finals of the ICCAs (of Pitch Perfect fame). Somehow, we’d managed to hook up a performance in a proper Harlem jazz club, singing a few songs between the sets of a badass singer named Michelle Walker. In hindsight, we were fish hilariously out of water, but Michelle was generous enough to let me sit in with her band for one tune, and afterwards she told me I needed to check out Kurt Elling. I did as I was told, liked what I heard, but it wasn’t until a few years later that I bought Nightmoves and fell hard for Kurt’s music. I know almost every contour of every phrase on that record – the extraordinary clarity of Kurt’s instrument and the exquisitely moving arrangements grabbed me and wouldn’t let go. Over the next few years, as I did my best imitation of a jazz singer, writing songs like The Thaw that borrowed from that great tradition, Kurt was a continual inspiration. Back to California. The day after my visit to Dorothea’s Shoppe, we have a show in Berkeley, and we hear word that Kurt will be in the audience. I don’t suffer from stage fright, but that night I am out of my mind and my body with nerves. Afterwards he is gracious, complimentary, and every inch the jazz cat with his elegant scarf and throwback idioms. A couple of months later, as we plan out Yule Songs vol. II, I dig out The Thaw and play it to the other singers as a possible album contender. They like it; Kevin volunteers to write the arrangement. Then we hear that Kurt is interested in guesting on the album. The Thaw, written by a 22-year-old hooked on Kurt’s music, is the obvious match for his voice. It’s the best Christmas present I could have hoped for. All I have to do is sit back and enjoy as my song is elevated to another plane, first by Kevin’s gorgeous chart – with its poised string-like phrases, pianistic flourishes and even a quote from my favourite Debussy prelude – and then by Kurt’s exquisite interpretation of my lyrics and melody, recorded in a hotel room in LA but sounding like a million bucks. The evening when his vocal take pops up in my inbox ranks in my top 3 trippy email-based experiences. Yule Songs vol. II comes out on 13th November, a few days before we open for Kurt in a sold-out show at Cadogan Hall. I’m incredibly proud of the album we’ve made. It has everything I want from Christmas – ice and snow, baubles and bells, mystery, memory, magic and merriment. And yes, this is a plug (You can pre-order your copy from Amazon UK or iTunes), but I also just had to tell you that story. Sometimes panning for gold really does work. A few nights ago I found myself in an airless, sleepless hotel room in Latvia, listening to Sir Ian McKellen being interviewed by Marc Maron on his WTF podcast. At the end of the episode McKellen recites a speech from the little-known Elizabethan drama Sir Thomas More. The play was a collaboration between several dramatists, and it's now widely believed that this particular scene was written by Shakespeare. Here's McKellen reciting it on another occasion. I was dimly aware of this scene from my undergrad days, but I'd never paid attention to it. This time it hit me like an electric current. And I immediately thought of Calais, and the migrants there, and all the discourse around them. Over the last few weeks I and so many other bleeding-heart liberals have tried to articulate our anger at the rhetoric used to dehumanise these people. Not surprisingly, Shakespeare nailed "the strangers' case" centuries ago. Joanna Newsom has a new music video. For those of us who have spent the last five years scanning the horizon for a follow-up to her brilliant triple album Have One On Me, this is no small event. The song is called Sapokanikan and you can watch Paul Thomas Anderson’s video here. Newsom’s music is like Vegemite: some wrinkle their noses at it while others make moonshine. * Just as her voice on The Milk-Eyed Mender defied any notion of what singing should sound like (it’s mellower now), her songwriting is almost perverse in the way she returns to the same melodic and harmonic ideas again and again, while wrapping the loops and filigrees of her lyrics around the metre in counter-intuitive ways. I tend to think that to praise a songwriter by calling her a "poet" is to misunderstand the particular challenges of the two forms. Poems are rarely enriched by music and songs rarely look good on the page. Newsom is a rarity in this respect: I love her music but think her lyrics are even better on paper. In the case of Sapokanikan, it helps to have an encyclopaedia to hand too. If a song has to be read, dissected, researched to have its full effect, has it really been successful? For most, surely, this kind of tricksy allusion is elitist and pretentious. But for me and a small minority of nerds, the cryptic-crossword challenge of unravelling meaning in this way is something to relish. It’s why I love Nabokov’s puns and Tom Waits’s salvaged dustbowl idioms and the collage of quotations in Berio’s Sinfonia. So I’ll admit that when I heard Sapokanikan, I printed off the lyrics – already transcribed online by my nerd comrades, of course – sharpened a pencil, and tried to figure out what the song is on about. (You can take the boy out of the English degree, etc.) It was worth it. What will survive of us is...? Joanna sets out the stall of her influences in the first line, “The cause is Ozymandian”. Like Shelley’s poem, this is a song about relics, myth and mortality. It’s also about New York City, whose streets she paces in Anderson’s video. “Sapokanikan”, which closes out that deliciously obscure opening couplet, was a Native American name for the area now known as Greenwich Village. The living, noisy, multi-storey city is reimagined here as a “lone and levelled” desert. “Will you remember?” is the central question the song asks, before furnishing examples of lives and loves buried and hidden and painted over. There are the bones hidden by the old Dutch master, the Titian painting discovered under Tobias and the angel, Arthur Streeton’s lost sweetheart Florry Walker. There’s John Purroy Mitchel, New York’s “boy mayor” who defied the corrupt kingmakers of Tammany Hall before his death in a plane crash. There are those who were never famous in the first place, buried in potters’ fields, who will never be excavated or studied. These characters place the song within what Greil Marcus calls “the old, weird America”, buried and mostly forgotten. There’s a sense of the hollowness of any attempt at memorial, be it through monument, flag or song (“The brave-men-and-women-so-dear-to-God/And-famous-to-all-of-the-ages rag”). These men and women are not famous to all of the ages; if they were, I wouldn’t have had to hit up Google in the first place. Those listeners who bother to piece together the shards of story become like the hunter in the song’s final verse, deciphering the stone. The lyric is not merely obscure but about obscurity, “cryptic at best”, its meaning half-sunk. Here too, “idling bird calls” soundtrack the long, slow process of forgetting. And just as Larkin’s almost-truth that “What will survive of us is love” jumps out arrestingly from the page, Newsom has a way of cutting from verbose obscurities to nakedly emotional lines like “Will you tell the one that I love to remember and hold me”. Here is the beating heart that pumps blood into the lyric. Here is the poetry that makes the Wikipedia scavenger hunt worthwhile. The album (Divers) is out on 23 October. On CD, mp3, vinyl and – wait for it – cassette. Hunters, decipherers, nerds, rejoice. Welcome to my new blog space! After years of being brainwashed by This American Life sponsor messages to try out Squarespace, I've given my site a much-needed overhaul. I'm hoping to keep this more regularly updated than its predecessor – though, if you're a long-time reader, you'll know I say that sort of thing all too often. If you'd like to read any of my old blog posts while you wait, they're still live at edwardrandell.wordpress.com.